This is Garden Riley Moose (actually I made him into Sophie Moose with the shocking pink gardening boots, snort! I pulled my colors from this wild and funky paper from K & Co that I got at Michael's. The background for the card is a piece of Core'dinations so the back is different than the front...so that means when its folded the inside becomes a different color. Cool, huh? So I let a bit of the inside show through by cutting off part of the top. Sentiment is from Unity (but it was in with the wrong kit so I'm not sure which its from???). Next up is Hammock Riley Moose. He cracks me up...just hanging out with nothing better to do all day! I have closeups below and you can see I added some green Smooch to the palm trees and Riley was stamped twice and popped up so he's really "swinging" from the Hammock. At the bottom I placed the sentiment (from A Muse) over a couple of punches including one section of a new EK Success border punch. Finally I added a bunch of loose Stampendous glitter to the card...both on top of the brad and then along the bottom of the top panel. Last I have Rainy Day Hanna for you. She is paired perfectly with the Piggy Tales paper "Rain, Rain go away" I colored her in to match with copics, added a bit of yellow stickles to her funky rain boots and some Eucalyptus to the umbrella. Ok, so thats it for now...my hand hurst from typing and I want to stamp!! Check out the Guest DT call forum over at Splitcoast HERE for more Hanna samples and to enter for yourself...theres still a few more days! This is for this weeks SCS color challenge: Tempting Turquoise, Lovely Lilac, Pink Passion, and Gable Green. Hello, ba-right!! This is Domestic Goddess Hanna, from Hanna Stamps. The sentiment says: "A clean house is a sign of a lazy stamper"...hehe! Love it! And have you seen all the new Hanna sets, OMG. I have had to be so good lately, and haven't bought any like all year, but, geez there are sooooo many new cute ones! But, What is it with me and the Pink CHristmas cards this year? I don't know, but I love them! This little card was a last minute inspiration the other night. I had been fiddling with my newest HAnna Stamps and couldn't quite get the card right that I was working on. (shown next), but as I was putting stuff away...I changed it completely and it came out JUST right! I stamped the tree with a few ornaments and the star and cut it off to be shorter. I added an A Muse oval underneath for a tree skirt :) The tree is colored in with my Stampin' Write Markers....Pretty in Pink, Certainly Celery, and Close to Cocoa. I added some depth with a blender pen and Purely Pomegranate and Wild Wasabi. The ornaments are all decked out with some Diamonds Stickles for just a bit of added sparkle! 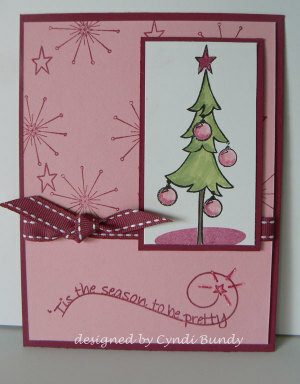 The card base is Pretty in Pink layered on Purely Pomegranate. I stamped the ADORABLE snowflake and little star all over the background with Pomegranate, masking off the bottom half. I wanted the greeting on the same piece and to stand out. (So of course I added a bit of stickles on the star there too) I have to say that my ABSOLUTELY favorite piece of this stamp set is the sentiment!! So, heres the other card, I'm not as wild about it...kinda blah. I was determined to use that saying on the background, my new copics, Brenda WAlton Peppermint Twist paper...you know...you get stuck on too may things and it just won't work. I think the problem is that I really just need more copic markers, LOL. ANywho, the card base is WIld Wasabi, 5.25x5.25...she was too big to get the sentiment on too unless I made the card square and turned the sentiment sideways...that part I do like. I also added some Wasabi ribbon, Red brads, and some stickles .